On the western shoulder of Nzuni ridge, the vicinity is studded with several impressive outcrops. One of these, a huge boulder with a low-lying overhang, facing southeast to the Nzuni Valley, has paintings that include drawings of animals, anthropomorphic figures, enigmatic or abstract forms and possible cultural or ritual paraphernalia. There are bovids, antelopes, possibly impala, which are portrayed in a foreshortened style and most likely cercopithecoids, depicted in naturalistic styles. 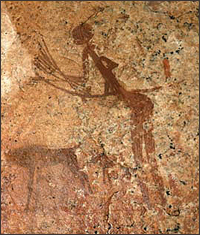 Humans are represented in two styles; stylised painted figures, and in semi-naturalistic single line outline profile. 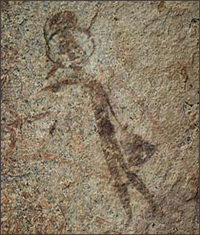 In both cases, the human figures are depicted engaged in some activity such as hunting, as the hunting weapons (bows and arrows), can be seen. Other scenes could be interpreted as dancing and fighting. These interpretations, it must be pointed out, however, are only tentative, for until the paintings are related to the life ways, beliefs and cosmology of the painters, we cannot be sure about their meaning. Varying shades of red ocherous paint have been employed, producing as a result, a confusing order of superposition. More humans seem to have been executed in scarlet red, which appears to overlie ocherous light red. On the last visit to the site in June 2003, a young man claimed that the site belongs to and is used by the Kitinali family for ceremonial performances. In fact, he asked for a sheep to appease the spirits, which he claimed had been disturbed by our presence. The nearest source of water is about 50m away while 20m to the east there is a rock shelter with a very badly faded painting of an unidentified animal. The ground in the vicinity is littered with lithics of LSA nature. About 10m southeast of Kisana Nzuni is a coarse granodioritic rock shelter with such a low and unimpressive overhang that it looks like a boulder. As the name suggests, it is interpreted by the local people as a picture of cattle, “Ngombe” in the Iramba language. However the subject matter shows no cattle, but instead includes game animals such as the eland and kudu depicted in naturalistic styles and also representations of presumably ethnographic objects, the identification of which must await further research. Some illustrations are suggestive of missiles such as bolas and strings, but they could also have symbolic significance that may become meaningful after studying the ethnography of the Wanyiramba or their predecessors. Since the paintings are not in good state of preservation their touristic potential is doubtful. Nevertheless they should not be allowed to deteriorate further for such sites could serve as case study and demonstration for any site management programmes. On the northern side of Ngwaginki (Kitaturu) A and about 50m away is Ngwaginki (Kitaturu) B. Unlike the previous site, it is easily accessible, especially from the school, and hence vandalism has taken its toll on the site. The subject matter includes animals such as giraffes and others, some of which resemble dogs and hares. Most prominent is a scene of stylised anthropomorphic figures executed in thick bold lines. One of the figures is depicted carrying something like a pot on the head while the other hand seems to be holding something like a small bag. Note that the human figures seem to have a ring around their necks. The less pronounced humans executed in thin lines do not display the rings. Aso depicted are thick parallel lines executed in a lighter shade of red. On the left side of the shelter is a human figure with a bow and arrows, seemingly aiming at at an animal surrounded by other miniature anthropomorphs. Overall, three shades of ochres red have been used, a dark shade, light and, dusk red. However no instances of superpositioning were observed, but judging from the sequence in other sites, it can be safely assumed that the white is later than the ochreous red.